With Frozen having earned over $1.2B, the highest-grossing animated movie ever, there was no way Disney would ever "Let It Go." Bad puns aside, Frozen has become a multimedia powerhouse in the six years (!!!) since, with a Broadway musical, a pair of popular short films, an ice show, video games, and appearances on ABC's hit series Once Upon a Time. But it's the long-awaited sequel that fans have been dying for, and now the first trailer for Frozen 2 is finally here. 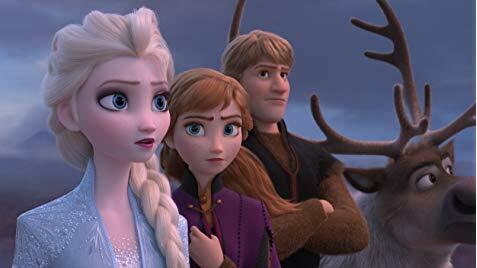 Once again featuring the voices of Kristen Bell, Idina Menzel, Jonathan Groff, Josh Gad, Santino Fontana, with Chris Buck and Jennifer Lee directing, Frozen 2 has been kept crazily under lock and key, so that we really don't know much about the plot. Even this teaser plays it close to the vest, although Elsa repeatedly using her ice powers in an effort to cross a vast ocean is definitely intriguing. Other shots tease an epic adventure, and I love that scene of Kristoff and Sven racing alongside a herd of reindeer. It does appear as if they'll be venturing deep into the forest, but for what reason is still a mystery. New additions to the voice cast include Evan Rachel Wood and Sterling K. Brown. This trailer kinda came out of nowhere, which is fine by me. I dig the secrecy. Frozen wasn't a film that really spoke to me, but I'm curious to see what happens next to these characters. Frozen 2 hits theaters on November 22nd, and let's hope there isn't another "Let It Go" earworm to deal with.